Photo property of http://abhimanyughoshal.com/ . Yesterday South African rock fans were ecstatic to learn that Metallica will be performing for them in April 2013 and will visit the country for a second time, so to celebrate I just had to feature one of heavy metal’s most iconic lead singers this week. James Hetfield was born on the 3rd of August 1963, he was the son of Cynthia (a light opera singer) and Vergil (a truck driver). Both of his parents were very strict Christian Scientists, they did not believe in using medicine or any other medical treatment. His parents divorced in 1976, James has two older half-brothers from his mother’s first marriage and one younger sister. Cynthia remained loyal to her faith even when she was suffering with cancer, she died of cancer in 1979 when James was just 16 years old. 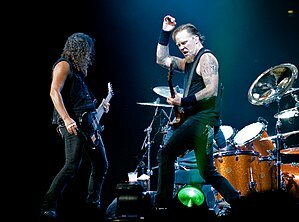 Metallica’s song “The God That Failed” was based on the death of James’s mother who believed that her faith in God alone would save her. After the death of his mother James went to live with his older half-brother David. James’s father Virgil died in 1996. James’s interest in music was apparent from an early age, at the age of 9 he started taking piano lessons then he moved on to David’s drums and at the age of 14 he started playing guitar. As a teenager he was part of a few bands such as Leather Charm and Obsession. When asked to single out his main musical influence , James singled out Aerosmith as his inspiration for becoming a guitarist. Led Zeppelin, Black Sabbath, Thin Lizzy, Ted Nugent and Deep Purple contributed to his love for music and served as powerful motivators for his own career as a musician. 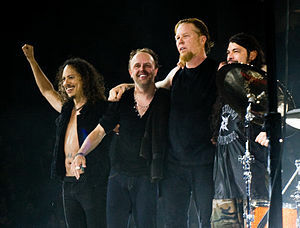 In the early days of the band Metallica experimented with a few different vocal and guitar combinations and eventually settled on the line-up as follows: James Hetfield on lead vocals and rhythm guitar, Lars Ulrich on the drums, Dave Mustaine as the lead guitarist and Ron McGovney on bass guitar who was later replaced by Cliff Burton. A frequent occurence in rock/ heavy metal bands is alcohol abuse and Metallica was no exception, from 1982 to 1983 Dave Mustaine’s alcoholism became the topic of heated debate and altercations between James Hetfield and Dave Mustaine. On the 1st of April 1983 the band decided to recruit a replacement for Dave Mustaine and decided to replace him with Kirk Hammett from the band Exodus. Ten days later Lars and James officially ejected Dave Mustaine due to his alcoholic tendencies. Dave Mustaine had to make his way home on a 4-day bus journey and he eventually formed the heavy metal band Megadeath. Dave Mustaine later came to wonder why his band members didn’t send him to rehab, but the other band members also drank heavily, although Dave’s alcoholism tended to be of a more aggressive nature. James Hetfield writes the majority of the guitar harmonies, as well as the lyrics, vocal melodies and he co-arranges the songs with Ulrich. Metallica’s 1991 hit Enter the Sandman was inspired by fears and nightmares James Hetfield experienced as a child. Another 1991 hit Nothing Else Matters James wrote as a personal song, never intending for it to be recorded and released to the public, but Lars Ulrich convinced him to use it for a Metallica song, much to the delight of their fans. Unfortunately James has been involved in quite a few onstage accidents, most notably an incident with pyrotechnics at the Olympic stadium in Montreal during the Guns ‘n Roses/Metallica Stadium Tour on the 8th of August 1992. James was the victim of a severe pyrotechnic accident during the song Fade to Black when a pyrotechnic exploded. Luckily James’s guitar protected him from the full force of the explosion, however the fire engulfed the left side of his body burning his hand, arm, eyebrows, face and hair. He suffered second and third-degree burns, but was surprisingly back on stage 17 days later, although his guitar duties was passed on to John Marshall for four weeks until he made a full recovery. It must have been frightening for the fans who witnessed the infamous incident in 1992, being helpless while their favourite lead vocalist was being engulfed in flames. James broke his arm numerous times while skateboarding which caused James’s management company at the time forbidding him from riding a skateboard while Metallica was on tour. While performing a cover of the Anti-Nowhere song “So What?” James experienced vocal complications which forced him to take vocal lessons for the first time in his life. He did basic warm-up exercises to piano keys with his vocal coach and the vocal coach gave him the tape to keep for future use, remarkably James still uses the same tape before any live performances or recordings Metallica does. While recording Metallica’s eigth studio album St.Anger in 2001, James decided to enter rehab in order to treat his alcohol addiction. After seven months in rehab and four months recovering at home with his family James was ready to rejoin his band. James is now clean and sober, determined to remain so for the rest of his life. I really commend James for the effort he made to become sober, because the industry may sometimes support the addiction more than sobriety. Touring and the pressures of the music industry can foster and aggravate addiction to harmful substances, so kudos to James. Some Kind of Monster is a documentary film which depicts many of Metallica’s studio rehearsals and concert footage while they were recording their album St.Anger in 2003. 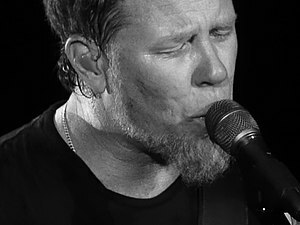 The film also documents many of the conflicts and issues the band were facing at the time including the departure of Jason Newsted, alcoholism, family commitments and the future of Metallica. Metallica needed a new bass player and recruited Ozzy Osbourne’s bassist Robert Trujillo and surprisingly Ozzy Osbourne recruited Jason Newsted into his band. Metallica’s ninth studio album Death Magnetic reached number 1 on the Billboard charts in over 30 countries during its first week of release just like every album of original material Metallica has released since Death Magnetic. This is quite a remarkable achievement considering that Metallica is categorized as a heavy metal band. 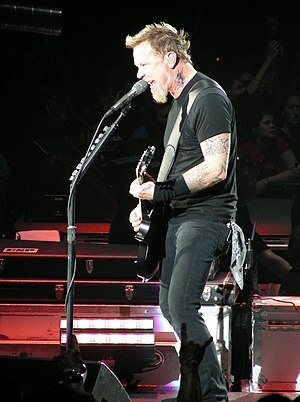 On the 4th of April 2009 James Hetfield, current band members along with any other musician that appeared on Metallica’s albums was inducted into the Rock and Roll Hall of Fame. James Hetfield aside from his career is most happiest spending time with his wife Francesca (former costumer for his band and hails from Argentina) and their three children Cali, Castor and Marcella. James and Francesca married on the 17th of August 1997, which means they have been married for the past 15 years, which I believe is quite commendable considering the challenges they have faced. James stated that his wife helped him mature and helped him to learn to deal with his anger issues more constructively, explaining that after they met, his destructive tendencies and behaviour embarrassed both of them. James loves outdoor activities which include hunting (he is a member of The National Rifle Association), snowboarding, skateboarding, water and jet-skiing, sketching and working in his garage customizing cars and motorcycles. He collects vintage cars, particularly those from the year 1963 and he enjoys working on classic automobiles. I think James’s childhood upbringing and anger issues has made him a unique and honest musician. He pours all his anger and aggression into his songs and lyrics. James has a raw quality to his voice and he makes you feel his pain through his music as well as his passion for his career. 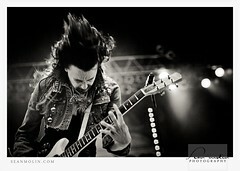 Today I’m proud to feature a talented local musician (fellow South African)from the rock band Seether. Shaun Morgan Welgemoed was born on the 21st of December 1978, he is widely known as the lead singer and lead/rhythm guitarist for Seether. All of his early life was spent in South Africa, his parents divorced when Shaun was still a child. At the tender age of 14 Shaun heard Nirvana’s Nevermind album for the first time, which inspired him to become a musician.He began to play the guitar by first learning to play “Polly” by Nirvana before starting to piece together bands that he could play with. His biological father did not approve of his son playing in bands, so Shaun ran away from home in order to cut a demo while living in friends’ garages and even their cars. Shaun eventually returned home to Pietermaritzburg to live with his mother and stepfather. He started playing in bands again, but quit playing music after three years, because he wasn’t making any progress. Shaun is one of three children, he has a sister called Lucy and a brother Eugene who passed away in 2007. Shaun attended Maritzburg College (which was renowned for their sports) in Pietermaritzburg where he showed promise as a front-row rugby player for his age group’s top teams in his first 3 years in highschool. In his third year as a rugby player Shaun injured his back and he was forced to give up the sport. Rugby is a hugely popular sport in South Africa. Prior to forming Saron Gas, Shaun was a member of a tribute band that used to play covers of songs from Metallica and Korn. In May 1999 Shaun became the rhythm guitarist and back-up vocalist of Saron Gas. Four other members excluding Shaun formed the line-up for the band which included a female vocalist, drummer, bassist and a lead guitarist. However the vocalist and the guitarist didn’t attend the band’s first practice, the remaining members decided to form a three-piece with Shaun on lead vocals and guitar. Saron Gas had moderate success up until the point where the bass player decided to quit in January 2000 which forced Shaun to find a replacement. Shaun Morgan phoned the only other good bass player he knew which was Dale Stewart. Later that year Saron Gas released their debut album entitled ‘Fragile’. In January 2002 the band relocated to the United States where they signed with Wind-Up Records. During this time the original drummer for the band decided to return to South Africa where the two remaining members had to fulfill Wind-Up Record’s request to come up with a different name for their band. The band agreed on Seether named after a song performed by the band Veruca Salt. Due to the fact that Americans had a hard time pronouncing Shaun’s surname ‘Welgemoed’, Shaun decided to use his middle name as his last name while performing, which is more convenient. Seether released their debut major-label album called ‘Disclaimer’ on the 20th of August 2002. In September 2006 it was reported that Shaun was engaged and was about to become a father once again. His fiancé gave birth to a son named Bowie in November 2006. In August 2007 Shaun’s brother Eugene sadly comitted suicide just a few weeks before ‘Finding Beauty in Negative Spaces‘ was set to be released. Eugene’s death was reported by Rapid City Journal, who stated that he had jumped to his death shortly after midnight on Monday 13th August 2007 from an 8th-floor window in Radisson Hotel in Rapid City, South Dakota. Shaun has 1308 tattooed on his four right fingers and 2007 on his left four fingers in tribute to the day that Eugene died. Seether’s song ‘Rise Above This’ is a tribute to Eugene, I have always really loved this song and it just means so much more after I learned about the subject matter. This song will never lose its potency and power, a true classic. Another song was written about Eugene on Seether’s latest album ‘Holding on to Strings Better Left to Fray” called “Pass Slowly”. In March of 2011 Shaun became a father for the third time when his daughter Gracelee was born. In addition to their major-label debut album Disclaimer, Seether has released three more studio albums Karma and Effect (2005), Finding Beauty in Negative Spaces (2007) and Holding On to Strings Better Left to Fray in 2011. In addition to these albums they released a compilation album titled Disclaimer II in 2004 and the live cd/dvd One Cold Night in 2006. In 2009 Seether released the original track titled “No Shelter”, the cover of George Michael’s Careless Whisper which was a huge hit and received a lot of radio airplay in South Africa especially and lastly “I’ve got you under my Skin” a Frank Sinatra cover. Shaun Morgan is known for his raw, emotionally charged and aggressive voice paired with Seether’s equally powerful teeth clenching rock songs. Seether appeals to quite a wide range of tastes, they have hard rock songs, ballads and rock/pop hybrids in their reportoire of songs which make them all-rounders in the rock genre. Definitely a band that have moulded themselves into a successful rock act. two great bands performing together is always a treat!